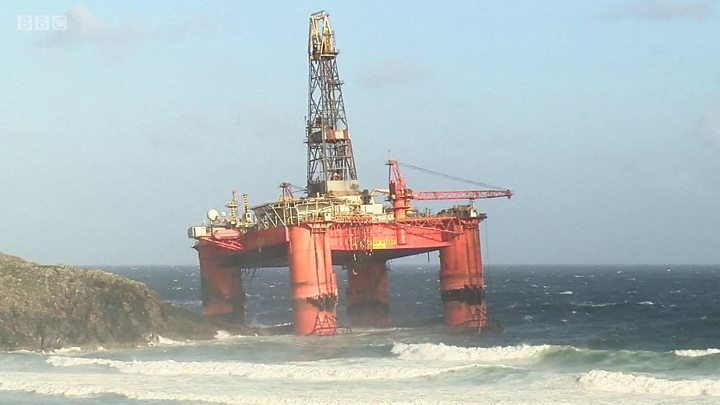 A 17,000-tonne drilling rig has run aground after being blown ashore on the Western Isles. The Transocean Winner, which has diesel on board, was under tow west of Lewis when it was hit by severe storms. It became detached from the tug boat overnight, before running aground at the beach of Dalmore in the Carloway area. Stornoway Coastguard said there were no personnel on board the rig and there was no risk to life. However, coastguard personnel have blocked access to the beach for health and safety reasons. The Marine Accident Investigation Branch has begun an investigation into the incident. The Maritime and Coastguard Agency (MCA) said it was monitoring for any pollution from the rig. The agency said Transocean Winner has 280 metric tonnes of diesel on board. Scotland's Environment Secretary Roseanna Cunningham said key agencies were doing what was necessary to "ensure the rig is secured and to minimise any immediate safety or environmental risks". A spokesman said: "Following the grounding of the semi-submersible drilling rig Transocean Winner on the Isle of Lewis, the Secretary of State's Representative (SOSREP) for Maritime Salvage and Intervention Hugh Shaw is now in discussions with the owners Transocean and the salvors. "The Maritime and Coastguard Agency's counter pollution branch and the SOSREP have both been monitoring the situation since yesterday evening and the local authority, police and Marine Scotland have all been kept informed." Salvage company Smit has been mobilised to deal with the incident, the MCA added. The Transocean Winner was being towed from Norway to Malta. BBC Alba reporter Angus Macdonald said the structure was "towering over the beach". He told BBC Radio's Good Morning Scotland programme: "The rig has more or less come ashore at the beach of Dalmore. "Dalmore is a well-known beauty spot. It is a sandy beach where a lot of surfers turn up because the waves are so good." Foster Evans, who visited the stretch of beach involved last week, sent BBC News Scotland online an image showing how the wide sweep of sand usually looks. An emergency towing vessel has been sent to the scene from the Northern Isles. Scotland used to have two of the boats available to the coastguard to cover the north and west coasts, before the UK government reduced the service to a single ship in 2012. Mr Allan said: "This morning the tow line between a tug and the Transocean Winner oil rig snapped in heavy weather, resulting in the rig going aground at Dalmore on the west side of Lewis. "I am grateful to hear that there have been no injuries reported after this incident but it does leave us with a significant environmental threat to deal with. "I am also deeply concerned to hear that the Maritime and Coastguard Agency's nearest emergency towing vessel was in the region of 14 hours away."